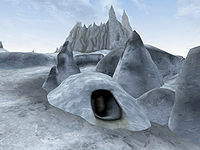 Benkongerike is a large system of ice caves, located northeast of Castle Karstaag, along the white northern shores of the Moesring Mountains region. Benkongerike houses roughly a half-dozen Rieklings and their Tusked Bristleback mounts, who take shelter in the caves when not in nearby Castle Karstaag. 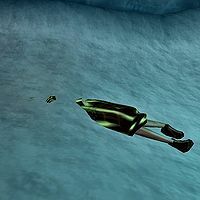 Benkongerike is also the abode of the headstrong Fryssa, a former member of an unspecified Mages Guild somewhere in Tamriel (presumably Morrowind) who was expelled for an unspecified reason, and up until the time of her death still held a grudge over it. Following her death (see Fryssa, Whitewalker), you can choose to take the final creation of Fryssa, Whitewalker, as well as her journal. The cave is divided into three levels; the upper level where the entrance and Fryssa are located, the middle level where a few Rieklings and a very small storage room are located and finally, the lower level where a few more Rieklings are strolling around another small storage area. 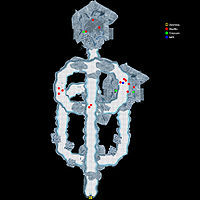 Benkongerike also appears in the Dragonborn expansion for Skyrim. This page was last modified on 20 January 2014, at 18:51.